If I told you that you can make a baseball jersey in less than a minute to preview how your baseball uniforms will look like, would you believe it? Sweating to create a fresh look for your baseball team is a thing of the past. 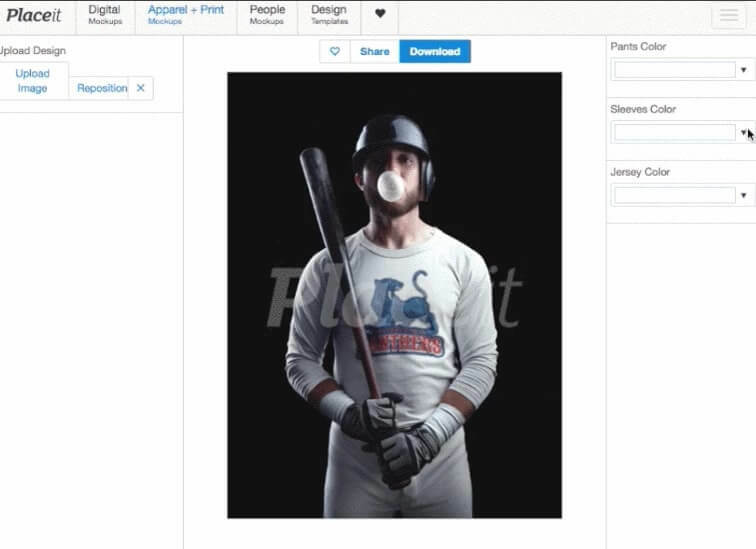 With Placeit’s baseball jersey templates, you can give your players a sneak peek of how amazing their baseball uniforms for the season will look! No need to get everyone involved in the jersey designing process, do it yourself and send them the photos for approval and to build up the hype, this way all they have to worry about is winning the game! We already showed you how to design a baseball logo for your team, so now that we have that part covered up, it’s time to make that baseball logo come to life with photos of real life ball players wearing jerseys, raglans and full baseball gear with your team’s logo! In this post I will show you how to make these baseball jersey templates in seconds, from your browser and without any design knowledge or skills at all! 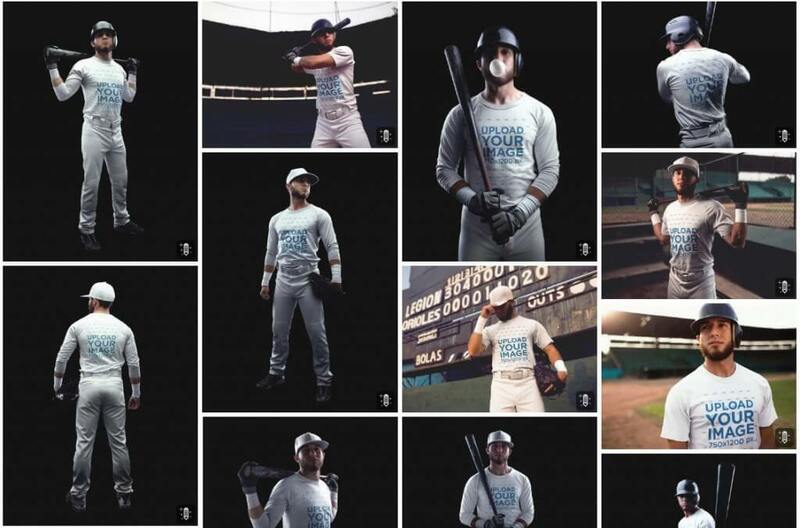 The first step in finding the right baseball uniform for your team is to determine which look is best for your players. You will want to ensure you look as good as the pros, this is why it’s super important to make as many tests as you can before committing to a specific look. But hey, that’s a pricey thing to do, right? Well, with baseball uniform mockups you don’t really need to make the actual uniforms to see what they will look like. Placeit has tons of different garments you can choose to visualize your team’s logo. 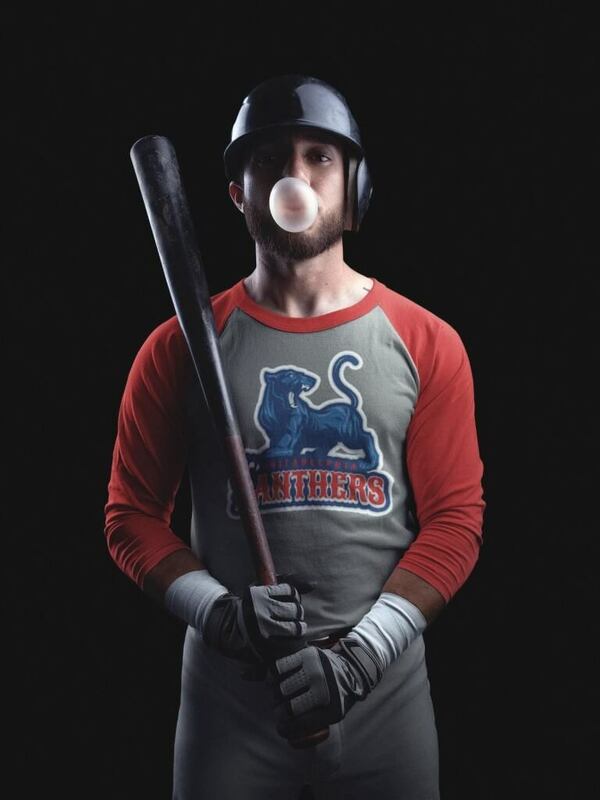 Raglan cotton t-shirts are a good way to get new uniforms fast and easy. Suited for all kinds of baseball players, from pre-Little League to semi-professional Baseball league, raglan t-shirts combined with matching color baseball hat, belt and pants make for an excellent baseball uniform. You will see how your players will start taking pride in their uniforms and strive to play as good as the look. Add your team’s logo to a jersey using our baseball uniform maker. 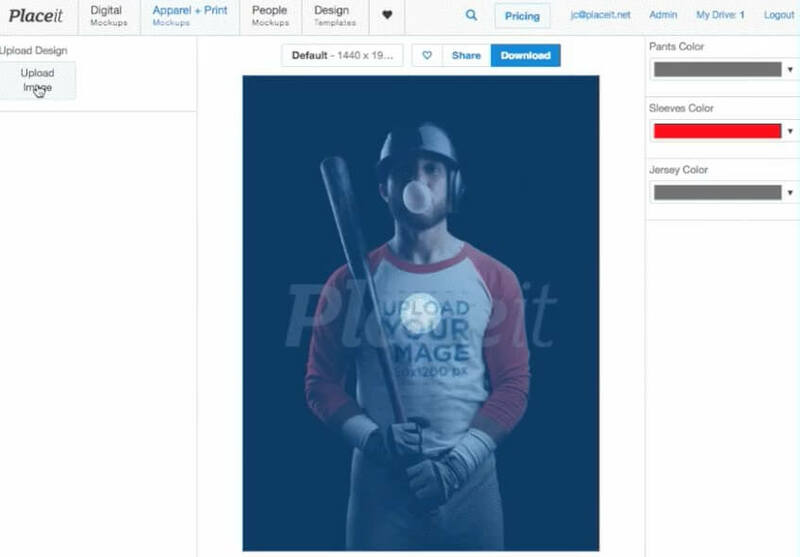 Simply upload your own custom logo or artwork to one of the many available baseball jersey mockups on Placeit. Designing your new baseball jerseys has never been easier! Why Do You Need Baseball Jersey Templates? ✓ To give your print shop a reference of how you want the end result to look like, this way they can produce a uniform that looks like your jersey mockup and avoid misunderstandings. Alright, so making mockups of your team’s new uniform for the season makes sense, right? Well, good news! The process of creating it yourself is as easy as it gets. 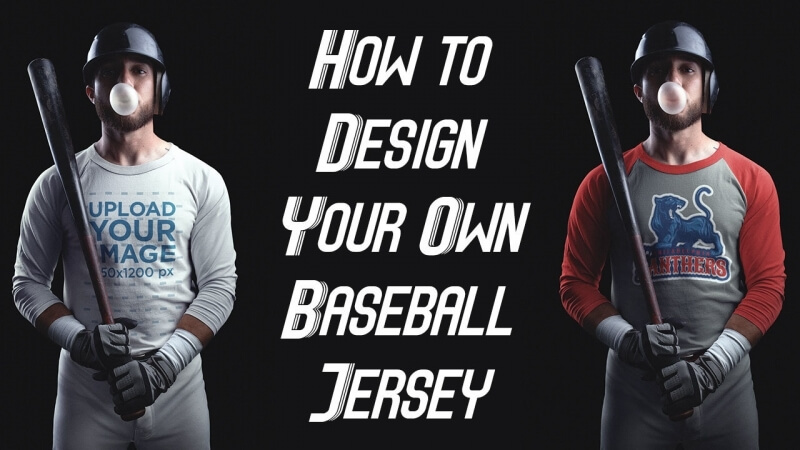 Follow these simple steps to make a baseball jersey to showcase your new uniforms like the pros. SHH! HERE’S A SECRET: There are even more to be added soon, so stay tuned! Step #2 – Choose your Team’s Colors. Each baseball uniform template will let you personalize the garments with the colors of your team. All you need to do is click on the color options on the right side to play with different options and settle for the one that will make your team’s logo stand out the most! If you don’t have one yet, you can use our baseball logo maker. Once you have the logo ready, simply upload the file, adjust it to where you want it to be positioned in the jersey and you will instantly see how your new jersey looks like in real life! So What Exactly Will You Be Getting? Once you hit the download button, you will receive in your email a high definition 1440 x 1920 pixels png image file that you can send to a uniform manufacturing company asking to replicate this baseball uniform mockup that you just created. Wondering What Else You Can Do with Sports Apparel Mockups? Not a player? Fans, friends, and family deserve the same amount of attention that the players get. With Placeit’s apparel mockups you can start dressing everyone with the team’s colors and show some pride and looking their best for every game. Choose from jerseys, t-shirts, caps, hoodie, raglan t-shirts, and more. 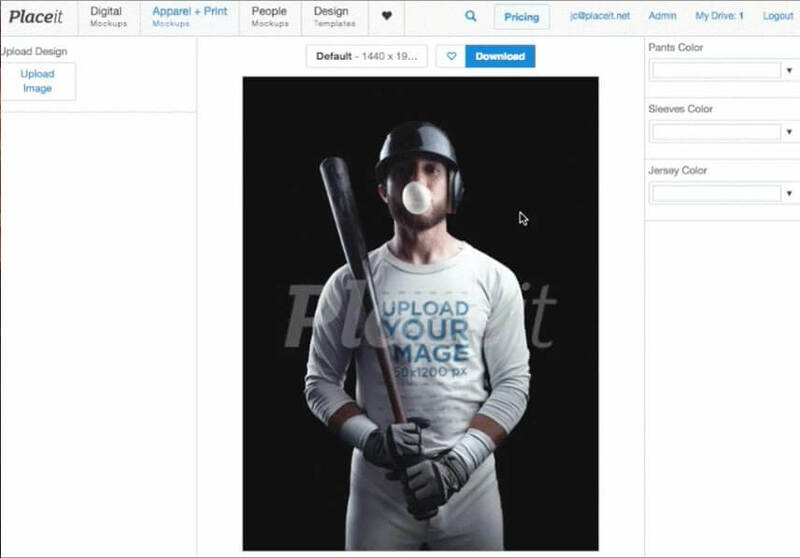 Placeit’s baseball jersey maker allows you to design the entire attire of a baseball team instantly. Best of all, you can preview your jersey before you download – all at your own convenience! It doesn’t matter if this is the first baseball jersey that you’ve created, you will get amazing results without sweating it. There’s no way to go wrong with Placeit’s baseball jersey templates. How Much Does It Cost to Make a Jersey Mockup with Placeit? $8 USD per image or for free when you subscribe to the Unlimited $29 Monthly Plan. Yes, that’s it. Instead of hiring a designer, purchasing expensive software or outsourcing your jersey mockups, make your own! These jersey mockups fall under an Unlimited Commercial license, that means you can use these to promote your team’s merch and make some extra money for the club! Once you’re done designing your jerseys, you’ll want to know where to print them, right? Well, we have a complete custom jersey guide with a handy directory of printing sites, check it out! Do You Have Other Options To Make Baseball Jersey Templates? Sure thing! Sports Templates is a website dedicated to creating uniform templates. Here, you can get baseball jersey templates for $69 USD. Their templates are pretty neat, but keep in mind these will need further edits in Photoshop, if you are a Photoshop expert then you should definitely give Sports Templates a go. While you’re here, why not check out our Quick Guide to building Sponsorship Packages? Might come in handy when you want to send these jerseys out to the printers! Stay tuned for our next post, in which we will show you how and where you can print your baseball uniforms to have them ready just in time for opening day! Get started building your custom baseball uniform today! Make a Baseball Jersey Template Now!